It is so easy to look at someone else’s business and want to have it all in exactly the same way in your business, isn’t it? You think you should do exactly the same as ‘they’ do but something inside you knows that it is not the right thing for you. And so I ask you, what is the point of all this comparing, all this feeling that you are not enough just the way you are? You have spent a great deal of your life conforming and capitulating and being whoever your family, friends, bosses, teachers, partners wanted you to be and finally you have woken up to your potential. But years of conforming are hard to crack. You are so used to being told how to be and so now that you are doing something for you, you have forgotten what ‘you’ looks like and you keep trying out other people for size. And it does not fit. ‘You’ fit but you do not know ‘you’. 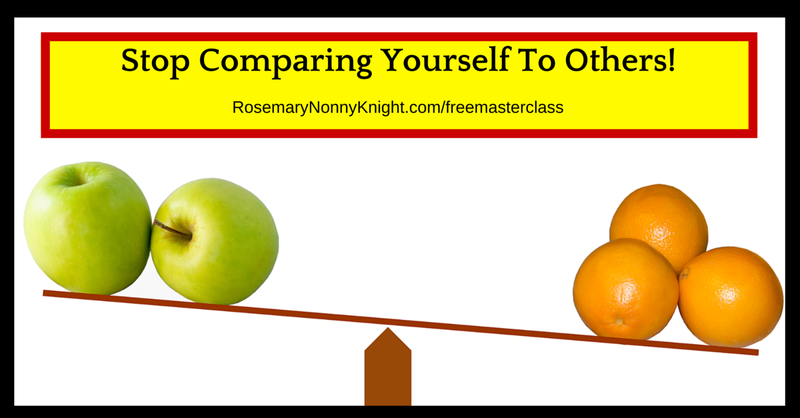 Is it time to take a little time to get clear on who you are again? There was a time when you were a child before people and events dumped disillusionment on you, there was a time when you were completely free inside and out. Why not return to that? Take some time to remember who you are – whether it is quiet or loud, mellow or active, whatever it is, YOU need to show up as you. And I do understand that you have to go through a period of figuring out who you are NOT, in order to get clear on who you are but recognize that this is a journey, not somewhere to build a camp and stay. Stop with all the comparing. Try different personalities out for size definitely because you are not stuck but always remember that this is a process of discovery and so allow yourself to grow and become the person that you feel most at home with. I always suggest this and I will again – Spend some time in journaling. Write out what you see yourself as, write out what you want to make happen in your lifetime, write out what you want to create over the next year… Write out how you choose to be. Let your self-definition come from within rather than external forces. Within you is unlimited power and when you try so hard to show up as someone else, you lose the use of your power. That is where your wealth lies and it may be a little scary to be present in this way but if you are determined to live a purpose driven life then there is no more room for compromising yourself and your values. You are in a battle for your best life and business and there are many distractions on the path to it. The distractions look pretty great and they may even look like the real deal but they are not. Their shiny exterior rubs off almost as soon as you commit to it and all you are left with are sparkles of glitter everywhere with no real substance to it. Do not be taken in anymore by all the shiny concepts of what you SHOULD be but decide who you want to be and show up powerfully today. Fight for, create the life & the business you want. And if you are ready to stop conforming, capitulating and living life as less than who you are and you want to be part of a small intimate group of professionals and business owners who are ready to take deliberate action to become highly effective and wealthy then take a look at Make Stuff Happen Now – A 4 week program that will accelerate the growth of you and your business.